With Halloween in the air, it’s time to dress up with your home with ghosts and goblins. Decorations are the perfect excuse to have some crafty fun! There’s no need to break the bank. So, here are a couple of ideas for decorations that are both easy and inexpensive. 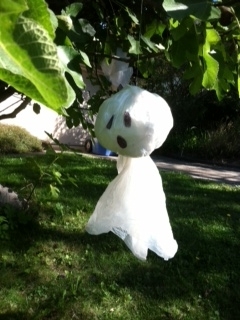 Hanging Ghosts – Use your stash of plastic grocery bags to make ghosts. Just buy some white trash can liners and a sharpe pen. Draw eyes and a mouth on the plastic trash liner, then stuff with grocery bags. Tie with a string or fishing line and hang in front of your house. These ghosts will fly in the breeze and are weatherproof! Lanterns – Make lanterns out of sandwich bags or old milk jugs. Break out a sharpe pen and draw faces on them! If using milk jugs cut a hole out of the bottom to put in the lights. Use either a string of white lights or battery operated tea lights. Window Silhouettes – All you need is black paper and a little imagination to decorate your windows. Just cut festive shapes like cats, bats and witches, out of black construction paper and hang on the inside of your window. If you’re low on construction paper, just paint anyother paper black and it will do the same thing. This entry was posted in activities, celebrations, crafts, do it yourself crafts, fall, rainy day fun and tagged Construction paper, Do it yourself, Entertaining, Ghost, Halloween, Happy Halloween, Holiday, Home on October 13, 2011 by Modern Mama.